SwiftSync* is an integration bus platform that provides such integration for agile application and software development organizations that want to improve their development efficiency, increase organizational visibility, manage regulatory compliance, improve time-to-market, and more. 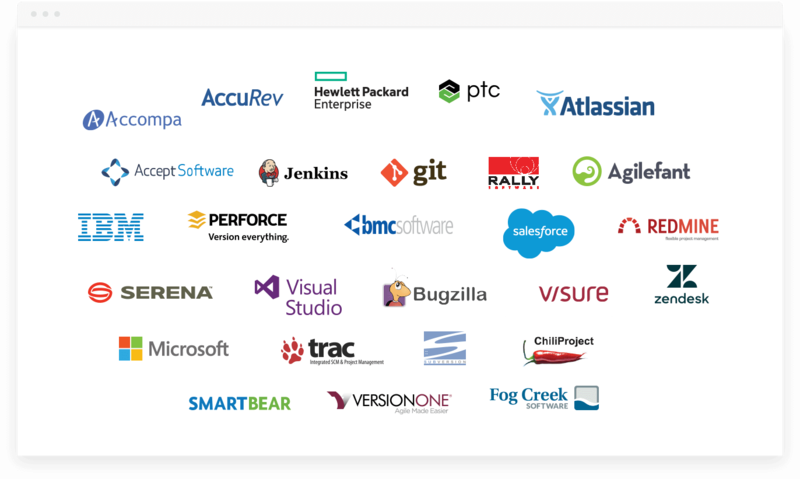 SwiftSync supports over 50 enterprise-class integrations with popular tools such as TFS, JIRA, CA Agile Central and many others including those from HP, IBM, Accept, Serena, and more. SwiftSync has been architected, designed and built to enable multi-directional synchronization across your existing development environment, delivering seamless collaboration to your product development organization. Besides that, it provides full transaction history, audit trailing and recovery capability in case of any sync failures. Using SwiftSync it is possible to visualize work across the organization, through an ecosystem of tools. For more details, please check the knowledge base. Don’t see your development system? Contact us and let’s check if we can add it! Integrate your Delivery Lifecycle! Build a DevOps culture with Lean/ Agile Enterprise! Contact us Today for a Custom Demo of SwiftSync!